Sonos plans a new speaker with Amazon's Alexa voice control tech | What Hi-Fi? Voice-controlled Sonos speakers aren't far off, as the firm is working on a speaker with Amazon's Alexa artificial intelligence tech. Soon you'll be able to speak to control your Sonos speakers. The company has confirmed to Variety that it's working on a speaker with Amazon's Alexa technology inside. Alexa is Amazon's voice-controlled personal assistant. It's found inside the Amazon Echo speaker, as well as a new Harman Kardon-powered speaker from Lenovo. It uses artificial intelligence to understand what you're saying. As well as following your commands to play or skip song and so on, it can fetch you information like the news, weather, traffic and facts. Sonos is already dipping its toe into the voice-controlled waters. 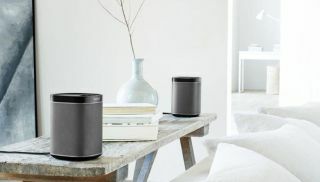 Back in August, it announced it would add Amazon Echo support to its speakers (so users could voice control them by speaking to their Amazon Echo speaker). This sounds like a welcome new feature, though a little clunky. It would require buying an Amazon Echo on top of your Sonos set-up, for one thing. So adding the functionality to the Sonos speaker itself makes much more sense. Sonos is also eyeing up further partnerships regarding voice control with companies including Google. "I'm very confident that we can deliver multiple systems to our users," said Sonos' new CEO Patrick Spence. He added that voice services will eventually work just like music services, with Sonos offering support for not just one but multiple personal assistants. "I'd love to be supporting not only Echo and [Echo] Dot, but also Google Home." All of which sounds great to us. The question is, when will Sonos' Alexa-powered speaker go on sale? Alexa, can you help with that?